This 1967 Gibson would have been (maybe even was) very comfortable at Woodstock, or the first Newport Folk Festival, maybe when Pete Seeger tried to unplug Bob Dylan's electric guitar. The LG-O was created in 1958, presumably for the coffee-house concert-in-the-park kind of atmosphere of the early folk revival. Somewhat smaller than the dreadnoughts and jumbos, it had a 24 ¾" scale and was only 14 1/8" wide at the lower bout—similar to the size of Joan Baez's 000 Martin. This made it lighter and easier to handle, while its all-mahogany body made it tough enough to sling over your back for the trek to the next jam. But it was still a Gibson, and had the power and resonance to fill the spaces and send the message. And 50 years of seasoning that mahogany has only made this guitar stronger. The LG-O has a solid mahogany top, back, sides, and neck, with a 14/20-fret rosewood fingerboard with pearl dot inlay and a one-stripe rosette. The serial number (861232) indicates the 1967 date, and the screw-on tortoise pickguard (introduced in 1963) is also “correct” for the year, as are the tortoise top binding, the blackface headstock with the decal logo, and the three-on-a-plate open nickel tuners. I'm guessing that the serious collectors who really focus on such things are wondering about the bridge--yes, it’s unfortunately the infamous Gibson plastic “experiment--and if the nut, saddle, and pins are original, and I wish I could tell you, but I can’t, and it really doesn’t matter. This is a 1967 LG-0 which plays okay but has too many cosmetic issues for collectors: lots of crazing/cracking/flaking of the finish, cracking binding throughout [with 2 small replacement patches], and some lifting of the middle of the plastic bridge. However, for those of us who really like to play old Gibsons, this is a wonderful alternative—or addition—to that 15-pound J-45 with its five-ply case. It is in good playing condition, now that a professional luthier has glued one loose brace to reduce a slight belly in the top, glued and cleated several cracks in the back, and replaced the small pieces of binding. The action is currently set up at a bit under 4/32” at the 12th fret low E for me, but with a working truss rod and an adjustable saddle it should be easy to customize it to suit your style. Cosmetically, it has major crazing of the finish (“to let the sound out,” as my old luthier says), especially at the end of the lower bout, fascinating finish patterns on the back of the neck, and its share of small dings and play wear. But, of course, the sound is pure 50-year-old Gibson! The chip board case is vintage--possibly original, I guess--but is in kinda rough shape, with parts of the upper rim torn and one latch not working. For safety I am tying it with a nylon guitar strap, which I will include for free! The familiar blue interior fits the smaller LG-O dimensions almost perfectly. It’s a suitable complement for this vintage instrument, and offers more than adequate protection for the moment. I have made every effort to describe and illustrate this guitar and case with scrupulous accuracy. Its return will not be accepted unless it can be shown that it was egregiously misrepresented in this listing. Please check out the pictures and ask any questions you might before offering to buy it. 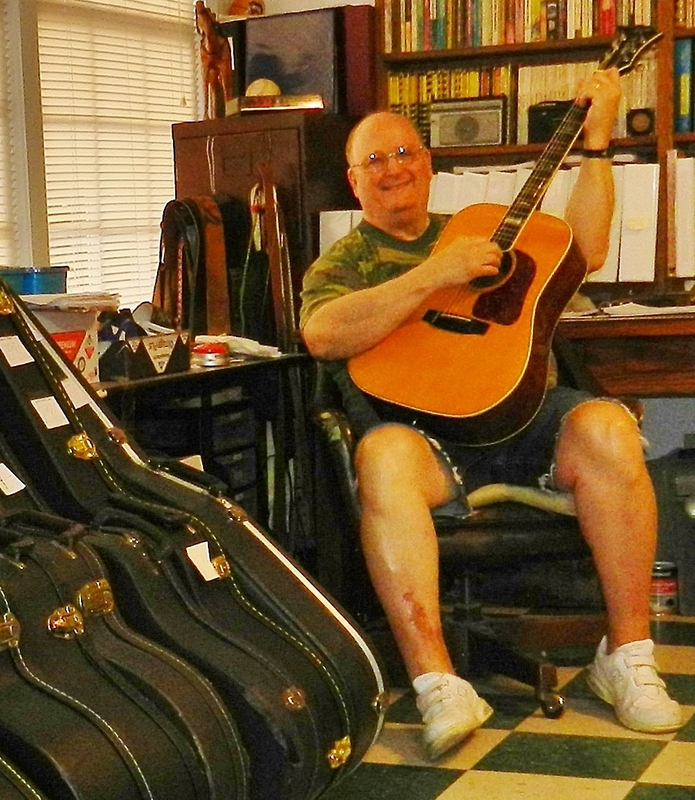 Thank you for your interest in this veteran Gibson guitar.